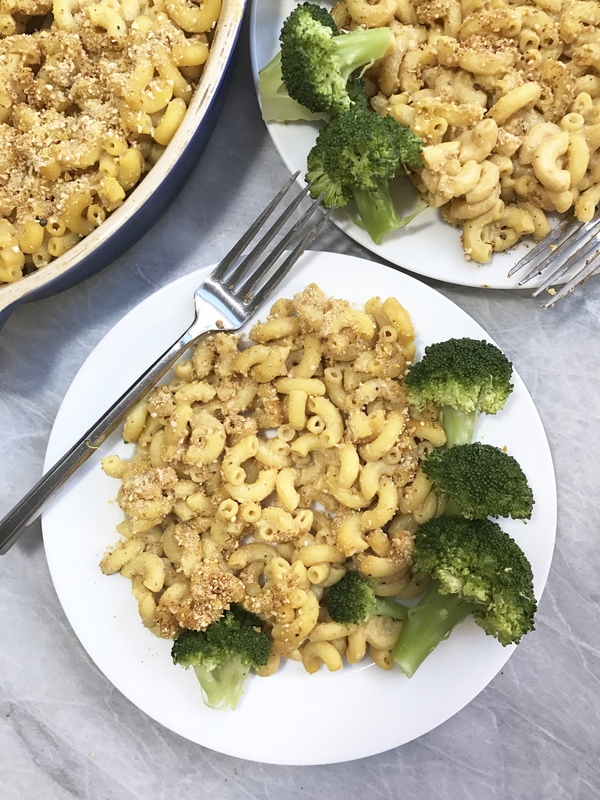 A delicious nut free/low fat version of Vegan Mac N Cheese. Probably the two reasons that stick out most to you is 2 &3. A lot of Vegan mac n cheese’s require a blender to mix a cheese sauce or a second pot to create a cheese sauce using a roux. I am happy to say that my recipe includes neither of those tools – we are getting down to the basics here. When I was coming up with how I could make an easy mac n cheese that didn’t require Vegan cheese or blending ingredients, I was trying to think of what I could use. The standard mac n cheese that you see everywhere usually consists of the potato, carrot & onion base. While I know many people like that, to me it just tastes like you’re pouring a thick soup over some pasta. I then remembered that Non-Vegans like to put greek yogurt on everything to make it “healthier” but still provide that creamy flavor. That’s when it hit me: unsweetened coconut yogurt. Now are you thinking, “Doesn’t that taste like coconut though?” Alone, it has a slight coconut aftertaste but since the yogurt is not sweetened then it really just tastes like plain yogurt. However, mixed with all the other ingredients you taste no coconut. Instead, you get this amazing cheese flavor with that slight tang from the yogurt. 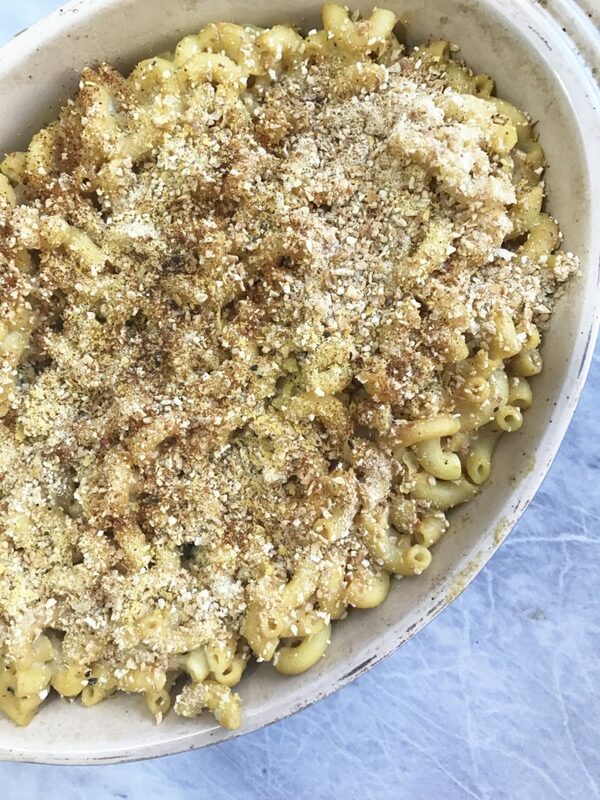 It is actually the best homemade Vegan mac n cheese I’ve ever had. With one cup of coconut yogurt being only 7 grams of fat, this recipe is pretty low in fat. The main source of fat is coming from the coconut yogurt which provides that cheesy flavor without all the horrible chemicals in it. Please try this recipe. You will certainly not regret it. I promise you. Remember if you try any of my recipes, tag me on Instagram @plantbasedjane so I can see! 1/4 Cup Bread Crumbs (I used WatUSee Chickpea crumbs. They're basically panko but made entirely from chickpeas. Perfect if gluten free). Cook pasta according to pasta to package instructions. When done, drain and return to pot. Add in all your ingredients to the pasta and mix to combine. Adjust hot sauce to preference! Transfer to oven safe dish and pour on bread crumbs. Put in oven on high broil for 5-6 minutes or until bread crumbs are toasted. Keep a watchful eye since all ovens are different. This was so much fun to make. Thank you! Great recipe! I’ve been looking for a mac & cheese recipe that doesn’t have any nuts. Thanks! 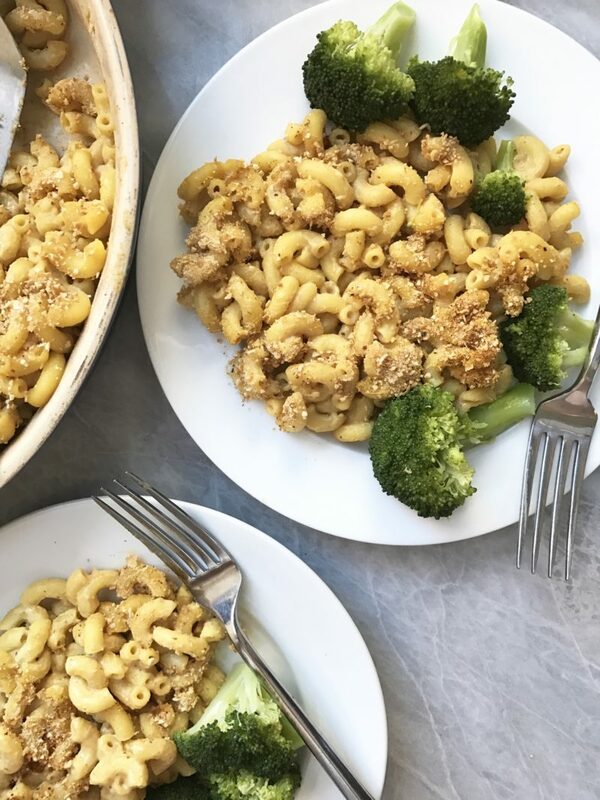 The only reason I haven’t made vegan mac and cheese yet is because I’m way too lazy to blend anything or soak cashews, definitely doing this tonight thank you!!! I’m making this tonight!! I’ll post a photo when complete, so excited! Is it possible to use other types of non diary yogurts? Like, unsweetened soy yogurt? I was going to buy a locally made vegan mac and cheese when I found this recipe. I made it after my evening class tonight. It was easy, quick and very satisfying! Thanks for your creativity, we’ll definitely make this for lunch this week. But may I ask how many people the recipe serves? So yummy and easy! I used almond milk based yougurt and it worked well. I also cooked a whole 16 oz box of pasta so I doubled the sauce. I skipped the oven part because it’s 84 degrees in my house – we don’t have central air. I will be making this again! I’m so glad you enjoyed, Jessica! Is it possible to use plain unsweetened vanilla yogurt instead? I can’t find coconut, but I’m wondering if the coconut is better than vanilla? I don’t recommend this as it will give it a vanilla flavor. Any plain unsweetened yogurt will be fine – without flavoring.